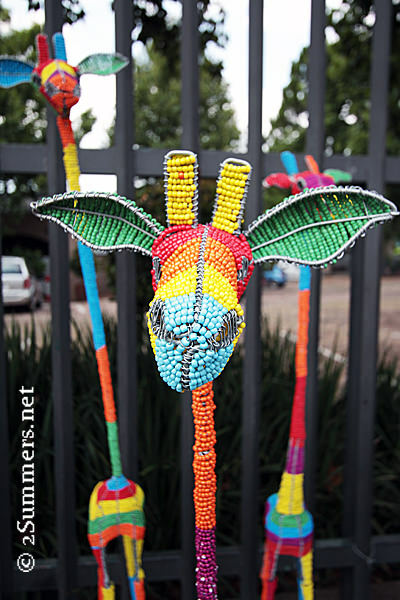 If you live in Joburg, you know that the most popular beaded animal of 2013 is the rainbow giraffe. 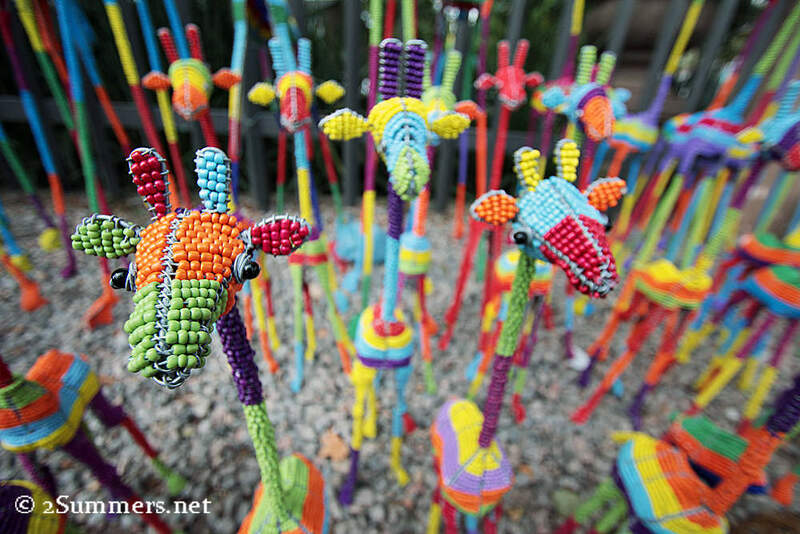 Beaded giraffes are nothing new in South Africa, nor are beaded animals in rainbow colors. 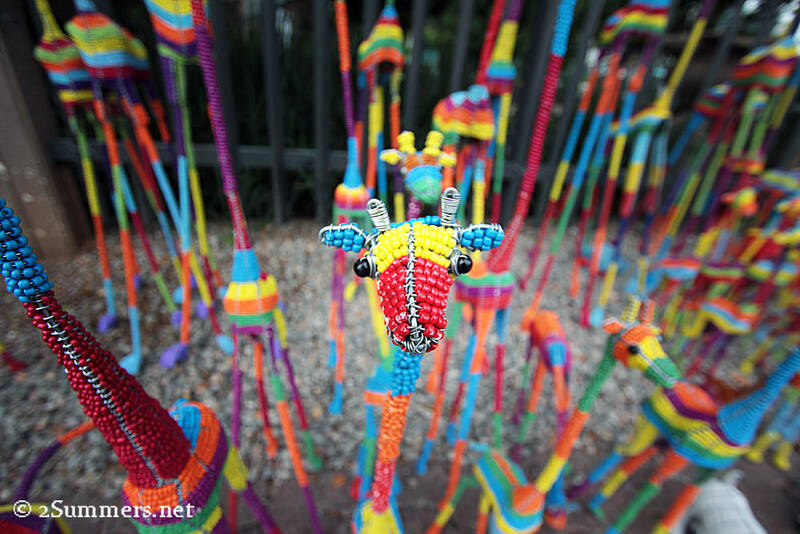 But this particular design — the giraffe with a super-long neck, loveable face, and bright, blocky horizontal stripes — appeared earlier this year and has taken the beaded animal world by storm. 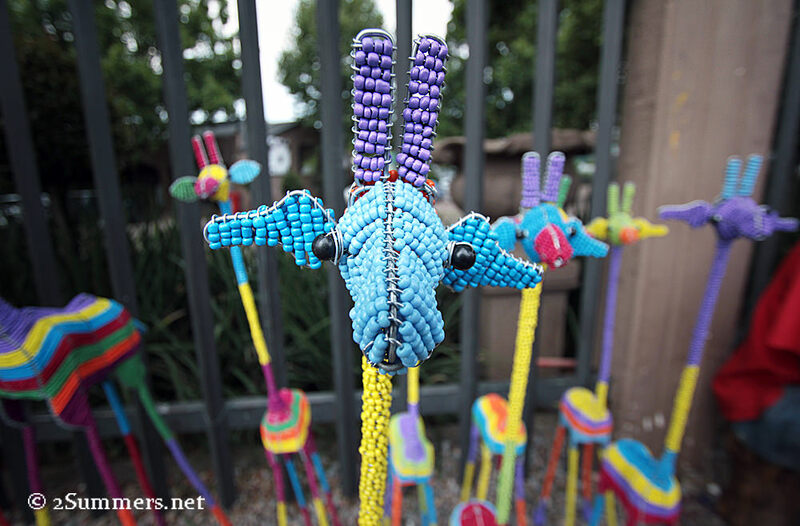 Every beaded animal artisan in town is churning out rainbow giraffes, and they’re selling like hotcakes. I can see why. It’s impossible to look at a rainbow giraffe and not smile. As far as I’m concerned there is no better last-minute Christmas gift than a rainbow giraffe, and you can find one pretty much anywhere in Joburg. But if you want the very best quality and selection of rainbow giraffes, there is only one place to go: the corner of Jan Smuts Avenue and Chester Road. The biggest herd of rainbow giraffes in town. I’ve been admiring the beaded animals on this corner, across from the Goodman Gallery in Parkwood, for years. I’ve driven past at least 1000 times and have often remarked that these guys make the best animals I’ve seen. 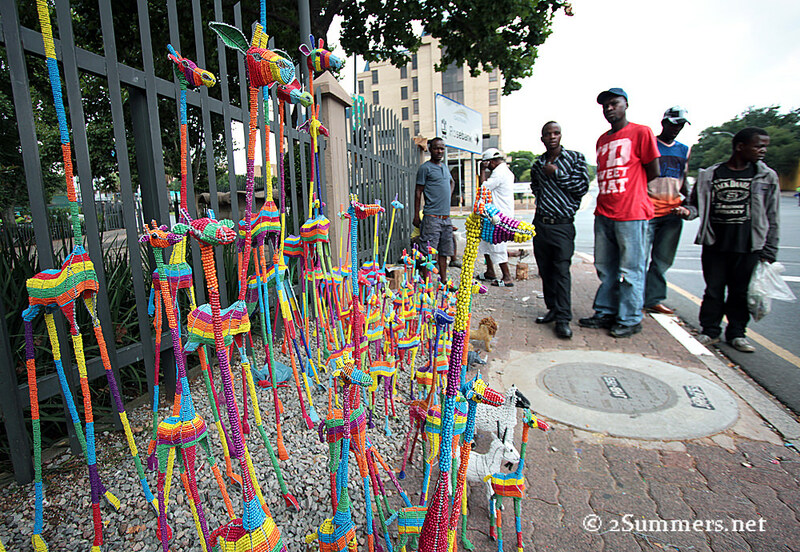 And since the rainbow giraffe craze began, the Jan Smuts corner guys have upped their game even more. This afternoon, for the first time ever, I drove past this corner and then turned around and went back. I could not resist the sea of rainbow giraffes; to me, these giraffes scream South African Christmas. My camera had to photograph them. Little giraffe with big eyes. My friend Michelle couldn’t resist the giraffes either. She bought two. Michelle with one of her new giraffes. Michelle and I chatted quite a bit with the Jan Smuts bead guys: Kennedy, Elias, Eddie, Peter, Panganai, and Lenon. They are all from Zimbabwe (like every bead artisan I’ve ever met) and have been making animals on that corner for about 10 years. They are lovely guys — I regret that it took me so long to stop and meet them. 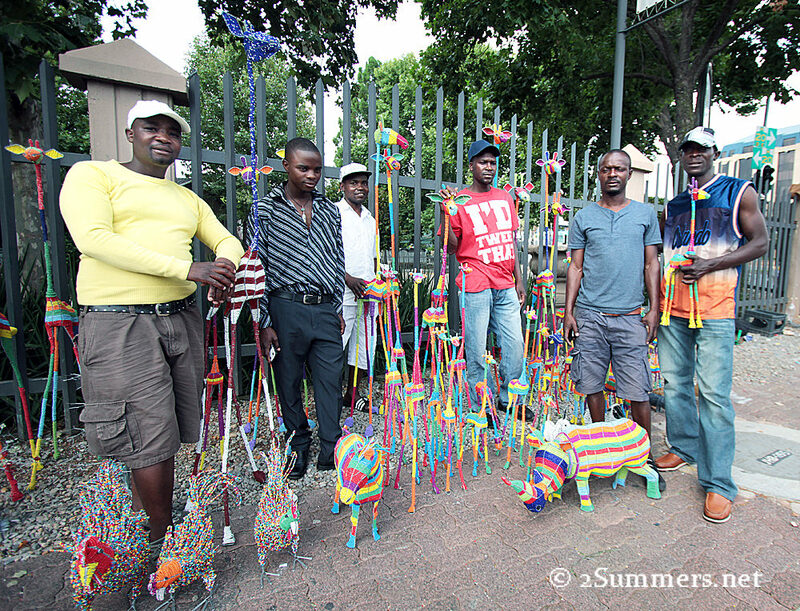 The Jan Smuts rainbow giraffe gang. I love them. 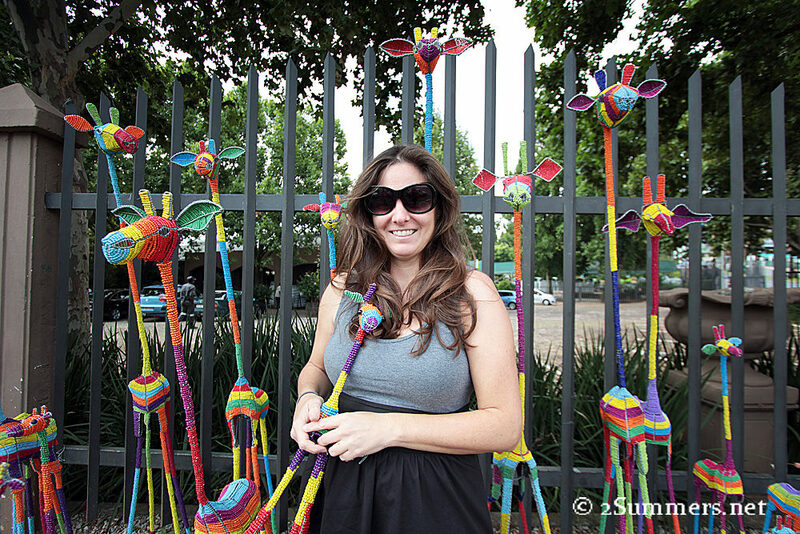 The Jan Smuts giraffes start at around R100 ($10) for the smaller sizes. These prices are very competitive in the Joburg beaded animal market. There. I’ve solved your last-minute Christmas-shopping problems. You’re welcome. Now get yourselves to the Jan Smuts rainbow-giraffe corner before it’s too late. You can park in the lot at the Garden Shop. They are beautiful!! Now I want one too! Haha, I know. They are irresistable. You would have solved my Christmas-shopping problem too, but it is a pity that the Jan Smuts corner is too far for me…but should I ever make it to Joburg again, I will get one of those giraffes! Nice pictures! I agree with Cloud, however thanks for the story and sharing them. Gorgeous photos! Yes, it’s impossible to look at them and not smile! I’m glad you agree. Belated Merry Christmas to you too. Thanks. In the end I bought one for myself too. I’ve always meant to stop at that big intersections. Looks so interesting every time I pass by. Soooo cool! I’ve always been so impressed at the bead work I saw in South Africa. I have quite a few bangles and necklaces, but no rainbow giraffe! Rebecca, unfortunately the rainbow giraffe was not invented until quite recently. You’ll have to come back for one! Haha. Me too. I bought two so I currently have a pair, although one will eventually go to my sister in America. Where can I get these in natal? I bought one at a market a while back, but need a few more. Hi Robyn, I’m not sure. I’ve never shopped for beaded animals in Durban but I imagine they are plentiful there. We love the funky giraffes! Great pictures! Many of the bead crafters in Zimbabwe and South Africa are making them in a number of sizes. Of course the quality and prices vary. We’ve seen the work of this group of guys are they’re quite talented. We work with our own group of crafters who we feel are the cream of the crop. They used to sell on the streets but we’ve enabled them to work from home for export. For those of you in North America, we’ll be stocking them in 3 sizes for the 2014 holiday season.